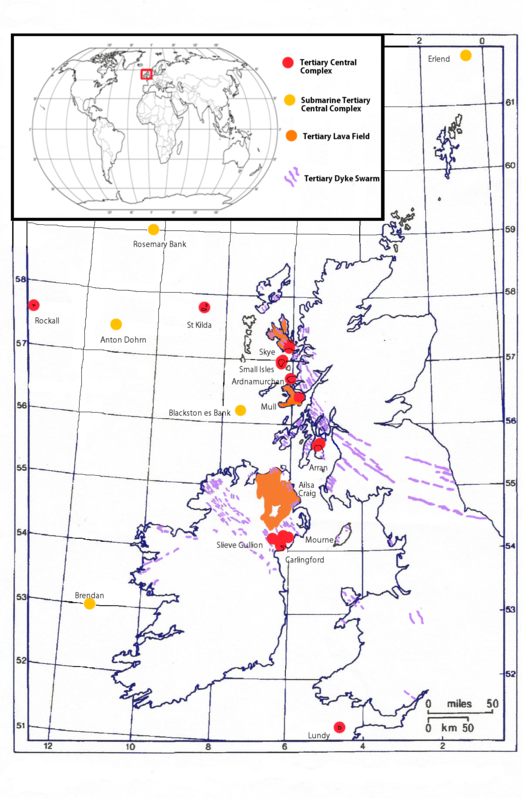 The Antrim Lava field shown within the British Tertialry Volcanic Province, itself part of the North Atlantic Lava Field. By Hazel Muzzy (Own work), via Wikimedia Commons. An earlier post here described Siccar Point, where an 80,000,000 year time gap is present between near-vertical tilted strata, and their roughly horizontal overlay. This gap corresponds to the formation and subsequent erosion of fold mountains thrown up when Iapetus, precursor to the modern North Atlantic, closed. 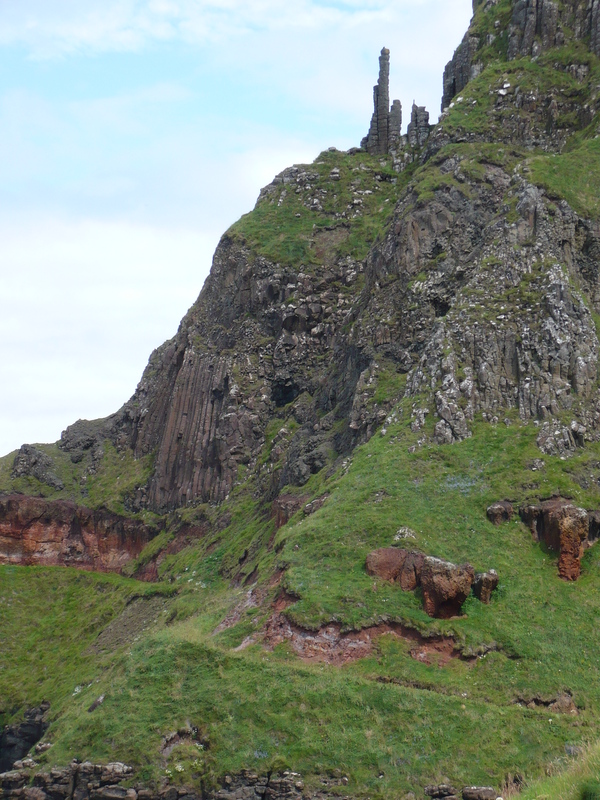 Today’s post is (mainly) about the Giants’ Causeway, part of the enormous lava field first produced when the modern North Atlantic began to open, and still growing at the Mid-Atlantic Ridge and, most spectacularly, in Iceland. Fragments of the initial outpouring were separated as the Eurasian and North American plates moved away from each other, and now can be found as far apart as Greenland and Denmark. 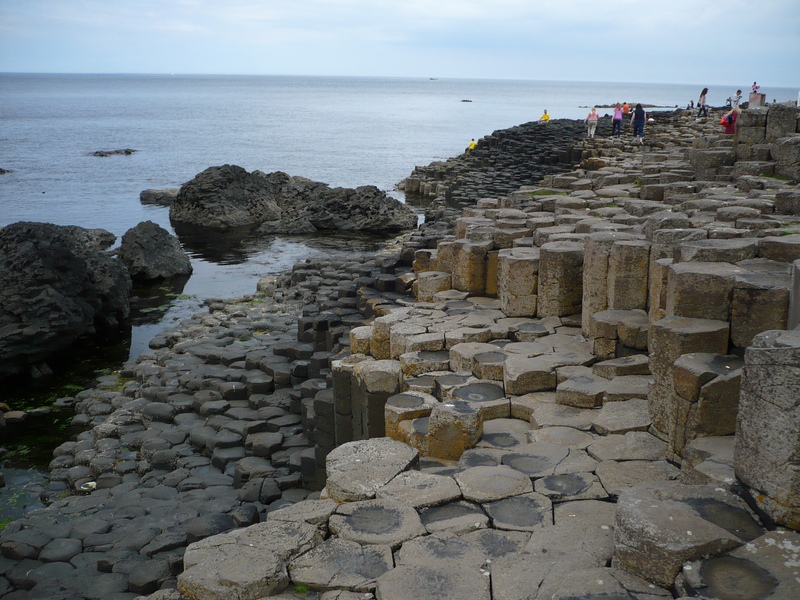 The Antrim Lava Field, of which the Causeway is part, was formed in three separate phases each consisting of many individual episodes. The most spectacular feature of the Causeway is provided by the second of these. Here, the lava cooled slowly, to generate a solid layer which stressed as it cooled, finally fracturing to give a complex array of columns, up to 10 metres high, and showing in places an almost regular hexagonal pattern. The lava of this second phase shows subtle chemical differences from the first, evidence of changes in the hot lava plume feeding the outflow. But what most excited me at the site was the existence of a band around 5 metres thick, between these columns and the lava beneath them. This layer is not a sediment, but a palaeosol, an ancient soil formed by in situ weathering of the top of the lavas deposited in the first phase. Its nature is confirmed by the presence of occasional unweathered lumps, and there are occasional round scars (“Giants’ eyes”) in the exposed surface where these lumps have come away. Humid conditions are confirmed by the presence of valleys carved by streams, and filled in by the later lava flows. The chemical composition is like that of tropical soils, which have undergone extensive prolonged leeching under warm and wet conditions, with the most insoluble materials, iron and aluminium oxides, predominating towards the top, and there are traces of charred plant roots in the topmost layer. So here we have direct evidence of an extended interval, variously estimated at between 100,000 years and 3 million years, between the first and second phase of eruptions. After my visit, I discovered that this interbasaltic layer is found across the whole area of the Antrim Lava Field, and that there is another such layer between the middle and upper lavas. There are also extensive dikes, penetrating all the lower levels, caused by the eruption of the lava layers above. The entire coastline has been extensively reshaped and eroded over the intervening millions of years, and most dramatically during the Ice Ages, and subsequent exposure to the storms of the Atlantic. For more extensive descriptions, see here, p. 30, or here, and references therein. Right: “The Chimneys,” columnar structures on skyline. Note additional columnar sructures to right and beneath. Below: Interbasaltic layer beneath The Chimneys. 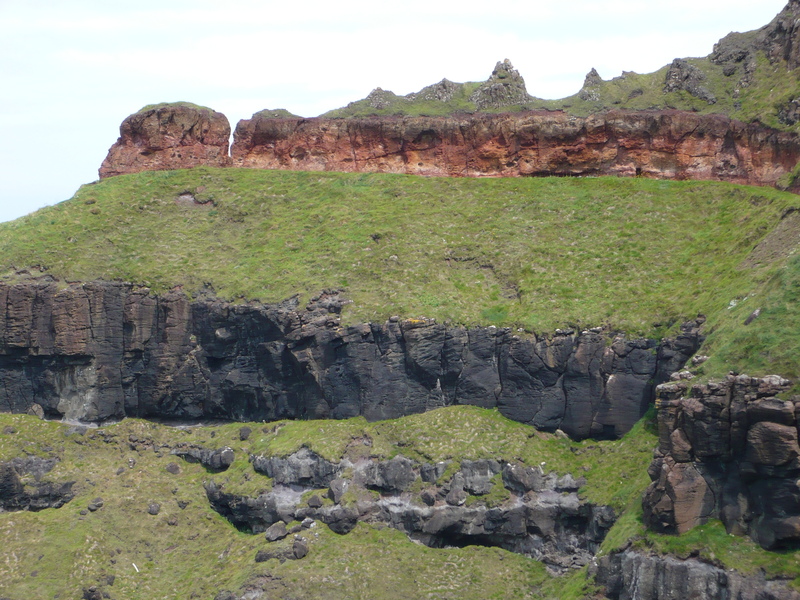 Click and click again to magnify: note uneven upper contact surface between weathered layer and basalt, due to erosion of palaeosol, and holes (“giants’ eyes”) in the layer where incompletely weathered basalt chunks have been dislodged. Further gradual processes of weathering, erosion, and exposure. One would expect any politician to be proud to have within his constituency so dramatic a statement of the Earth’s history. Not so. Northern Ireland Assembly member Mervyn Storey, who is currently Chair of the Northern Ireland Assembly Education Committee, is vice-chairman of the Caleb Foundation. This body rejects the whole of modern geology as well as evolutionary biology, and claimed credit (if that is the correct word) for temporarily persuading the National Trust exhibit on the formation of the Causeway to give Young Earth creationism parity of treatment with scientific geology. 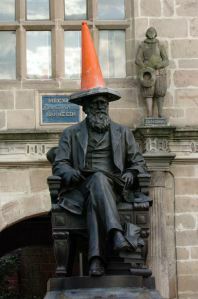 The resulting outrage led to a letter writing campaign with its own Facebook page (which survives as a discussion forum), and eventual removal of the offending language. I was amazed when I learnt what Storey considered to be the real cause of the Causeway; Noah’s Flood. Surely, I thought, even he would be aware that basalts had an igneous rather than an aqueous origin. 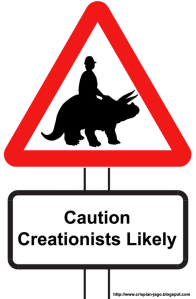 It was only later that I learnt of the Flood Geology version of creationism. According to this, the year of Noah’s Flood was accompanied by a catastrophic remoulding of the entire planet, including dizzying motions of the continents, and massive outpourings of lava. (No matter that there is absolutely nothing in the Bible to suggest anything of the kind.) This is why the creationist literature is full of attempts to revive the long-dead conflict between catastrophism and uniformitarianism. As I mentioned in my last post, T. H. Huxley had pronounced the obituary on this conflict in 1869, but I do not think that people like Melvyn Storey pay much attention to Huxley. In the past, when I have written to the museum about necessity to show the public an alternative to Darwin’s theory (and let’s stress it is still only a theory), they have been quite dismissive. They could be subject to a legal challenge under equality legislation within Northern Ireland if they chose to ignore alternative views that many people here in the Province believe in. This takes us to the heart of the matter. Equality legislation is about how people are treated as a result of group membership, rather than as individuals. Denial such as Storey’s is based not on reason or religion, but on his own group loyalty. Northern Ireland, notoriously, is inhabited by two rival tribes. One tribe is overwhelmingly Catholic, accepts the facts of evolution and an ancient Earth, and has traditionally sought to be ruled from Dublin. The other, to which Storey belongs, is biblical infallibilist Presbyterian, believes that the world must have been made in six days some 6000 years ago because God said so, and is fiercely insistent on being ruled from Westminster. If Storey were to accept the scientific evidence, that would mean letting the requirements of truth override the requirements of tribe, which is unacceptable. And finally, time as sequence of events. 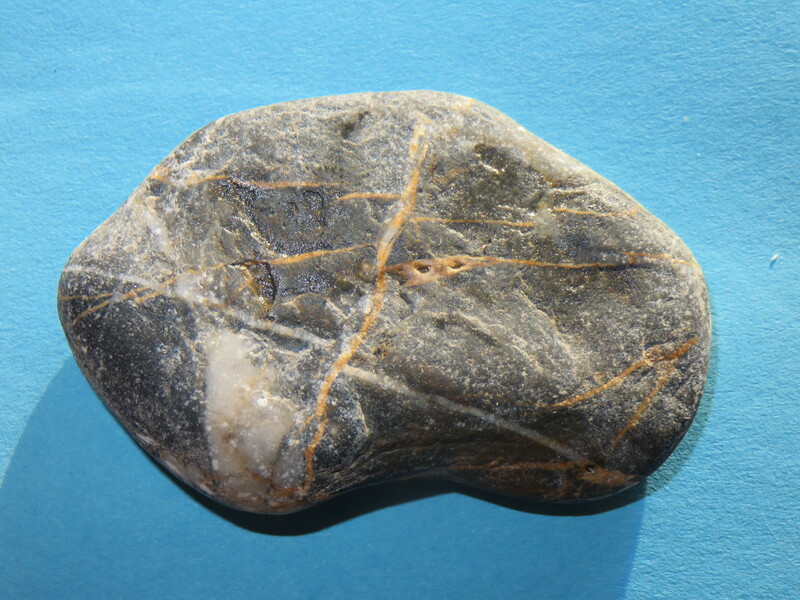 I show here a photograph of a pebble, collected on the beach at Benalmadena, in southern Spain. This is a geologically interesting area because that is where the African plate moving northwards presses against the Eurasian plate. Around the rim of the pebble, especially at 2 o’clock and 6 o’clock, you can see a hint of separate layers. These are not strata, but caused by the lining up of tiny crystals in the rock under pressure. The pebble is crisscrossed with white lines (quartz, carried there in superheated water) and pinkish lines (the same, but contaminated with iron) in various directions. The thickest of these pinkish lines runs more or less from top to bottom of the image, and it is easy to see that this line defines a fault, with the rock material having yielded and been pushed upwards on the left-hand side. Thinking about how the lines cross each other, it is clear that the pebble has undergone at least two separate episodes of intrusion by white quartz, and two by pink quartz, the more recent of these corresponding to the fault formation. That’s four separate events, involving at least two separate sources of quartz-bearing fluid, after the rock had already formed and then been subjected to enormous tectonic pressure, but before this particular piece was detached, to be worn down in the water and eventually deposited on the beach. As Yogi Berra said, you can see a lot just by looking. And one thing you can see, if you are prepared to look, is that it takes millions of years to make a pebble.